When Chef Michael Symon featured Farmer's Ground Polenta on "Symon's Suppers" a few weeks back, I knew I had to make polenta from scratch. In the show, Symon buys the freshly ground corn meal from a NY farmers market and meets the farmers behind this local, high quality, and certified organic product. The grain, sold at an outdoor market, comes in a brown bag, and something about the whole experience is both rustic and honest. This is how food should be. Close to the source and honest. Since watching that episode, I have been itching to make polenta from scratch. I'm not talking about the yellow polenta logs that we seem to stockpile in the pantry, I'm talking about the real deal here. Hand ground, hand whisked, back to nature, honest food. There's something about that whole Farmer's marketing experience that makes food taste better and I believe that food is so much more than fuel. Food can make or break and experience. Unfortunately, I am far from the NY Farmer's Market at which Farmers Ground sell their grain and the Farmer's markets around here are either open when I am at work, or on Saturday (which is the Jewish Sabbath, a day on which we do not conduct any business). As much as I longed for that rustic and honest brown bag full of freshly ground grain, I drove to Whole Foods to see what I could find. 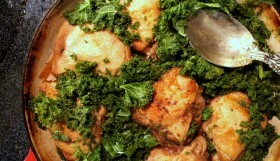 In his show, Symon is bringing real food to the masses and bringing people back to the dinner table. There's a way Chef Michael Symon connects with the ingredients and the audience to highlight the ease with which you can make a casual dining experience a reality. I can't find a clip of the polenta episode online, but check out how excited Symon as he makes fried potatoes come alive. It's this same energy that got me excited about making this dish. Now that I look back at it, I think this lamb-stock grilled polenta one of the best things I have ever cooked. Measure 2 cups of polenta and set aside. 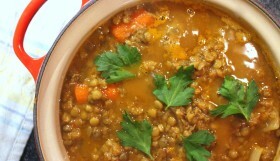 Put your lamb stock in a thick based pot over a medium heat. 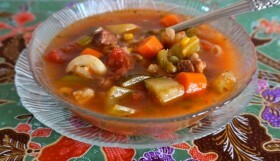 If your lamb stock was frozen, be sure to strain it once it's defrosted, depending on how you made the stock, there may still be some vegetables or herbs in the liquid. Add three cups of water to the lamb stock to keep the the grain:liquid ratio at 1:2. Bring to the boil then lower the temperature. 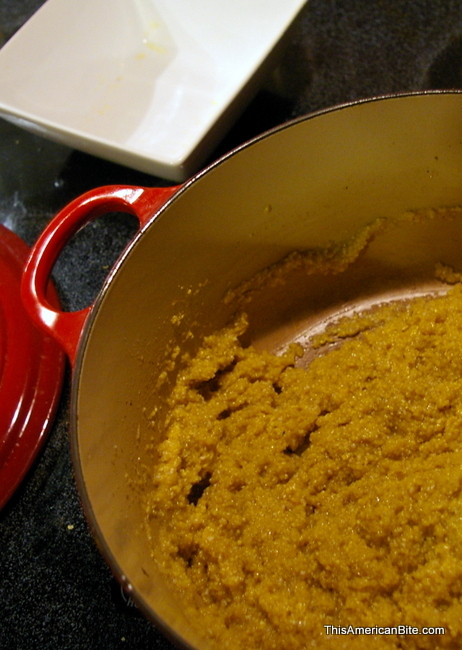 Slowly pour the grain into the liquid, whisking the polenta gently while you pour. Add freshlyground salt and black pepper to taste; continue to whisk the polenta gently until it begins to firm up. This should take no more than five minutes – and you'll know when it happens. It's one of those culinary aha! moments. 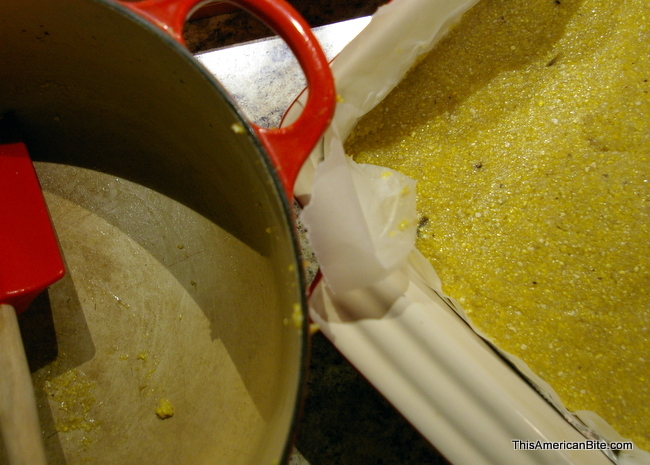 Line a 9 inch square baking dish with baking paper and pour in the hot polenta and do not trim the edge of the baking paper. 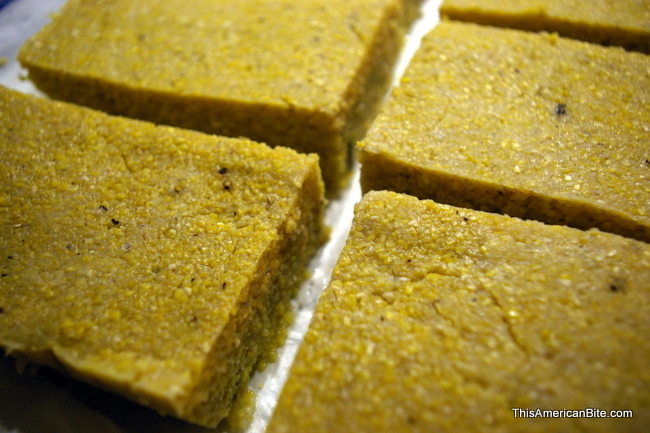 When it comes to remove the polenta from the fridge, you'll want to lift it out of the baking dish by lifting the paper. 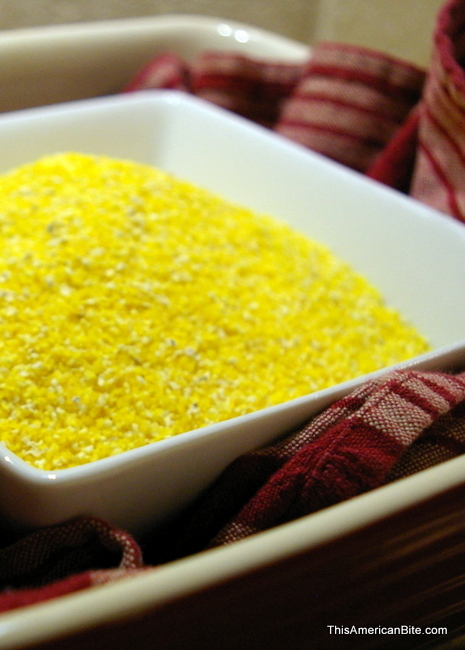 Smooth the top of the polenta with a rubber spatula, cover with plastic wrap and set it in the fridge for 2 – 24 hours. Using stoneware seemed to fit with my "honest cooking" kick and a 9 inch square dish gave me slices of polenta that were about 1 inch thick. This is a very generous portion, but I like how the crispy grilled outside kept the inside moist and juicy. 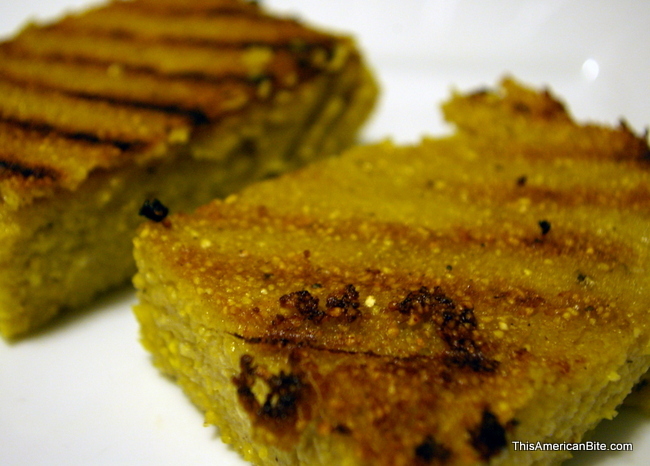 You can use a larger dish for thinner slices, or cut the polenta into smaller slices when you grill it later on. 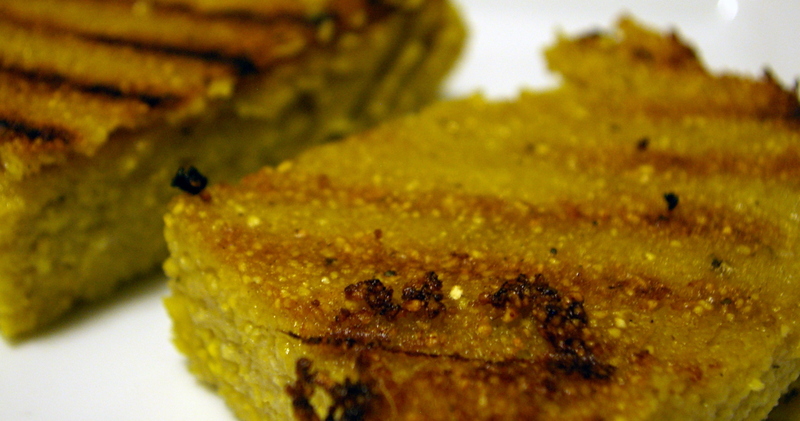 When you're ready to grill the polenta, remove it from the fridge and gently lift from the baking dish. Set it on a cutting board then peel back the baking paper. Cut into the desired portion shape and size, I made six large rectangles that were each about an inch thick, then sliced the other two rectangles in half to make another four thinner (half inch) portions. 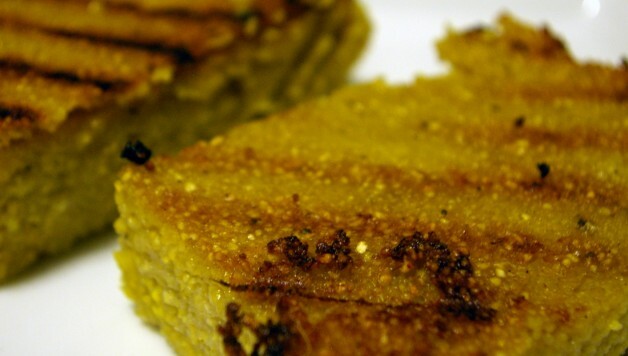 Preheat a skillet and lightly brush both sides of the polenta with olive oil. Let it cook for about three minutes, or until you have those beautiful grill marks, then flip and cook for another three minutes. Remove from the skillet. The polenta is delicious when served hot – and I would recommend doing so, but if you do allow it to cool a little, the flavor of the lamb stock becomes ever so slightly more pronounced, so try some of this at room temperature with a glass of red wine or port. 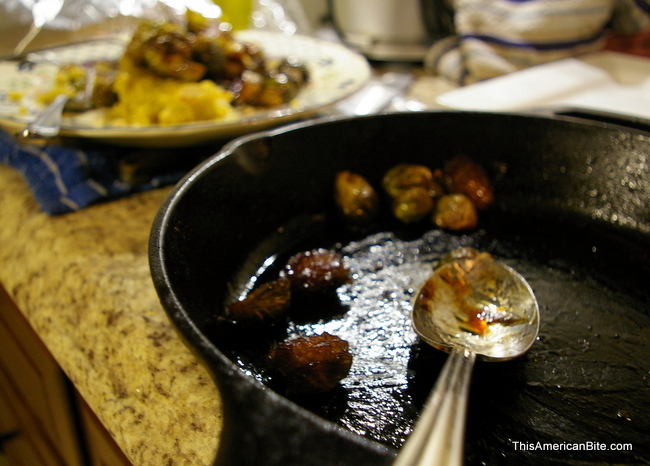 I served the polenta topped with brussel sprouts that I carmelized with lemon, balsamic and maple syrup. It was delicious. 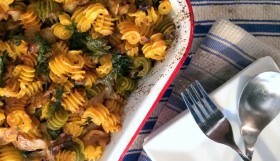 Once my wife and I sampled this dish, dinner didn't even make it to the table – we ate, sharing a plate and laughing with two cast iron skillets on the stove-top behind us. In this day and age, that might be as rustic and honest as dinner can get.